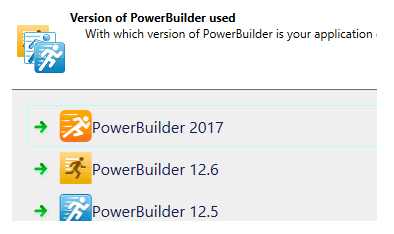 Visual Expert now supports PowerBuilder 2017. You can select your PB 2017 code by pointing at workspaces, targets, files (PBLs) and/or folders (containing PBLs). "Open in PB IDE" if you right-click on a single item in the Visual Expert source code view. "Insert in PB Todo list" if you selected several items in the treeview. What if the PowerBuilder code is managed by a Source Control? If you use a source control, Visual Expert will call the PowerBuilder API to check-in your objects before opening them in the PB 2017 API. Then, the corresponding painter will open as usual. Note that in the Visual Expert macro parameters, you can choose to open Windows in the layout or source code view of the PB 2017 IDE. A tight integration with Team Foundation Server (TFS) is expected shortly. This will allow selecting your code from TFS directly. Visual Expert will automatically retrieve your Powerbuilder code from TFS anytime the code analysis is executed.